South Webster senior Olivia Messer signed her letter of intent to enroll and run track at Shawnee State University beginning this fall. 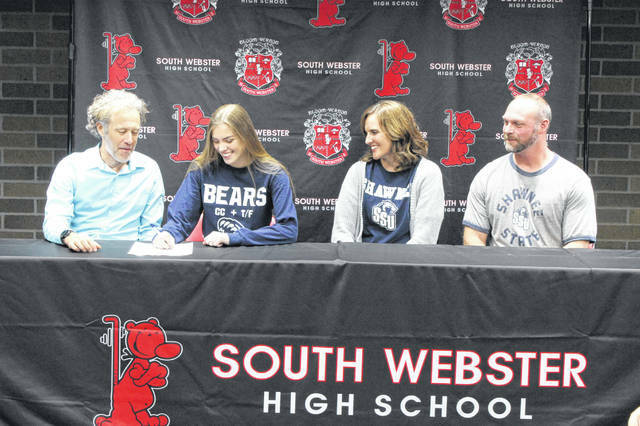 SOUTH WEBSTER – At a signing ceremony Monday afternoon at South Webster High School, Jeeps senior Olivia Messer signed her letter of intent to run track at Shawnee State University beginning this fall for the Bears. Upon enrolling at Shawnee State this fall, Messer plans on majoring in Psychology while pursuing her bachelor’s degree. Following graduation this May, Messer will look back fondly on the memories made with her friends while running in the Jeep uniform, memories that will last a lifetime. With her and her teammates senior season still upcoming in track in the Jeep uniform, Messer is still working towards accomplishing those goals she’s set for herself since her junior track season ended a year ago. When friends and family began making their way to support Messer at her signing, she humbly was worried about the amount of food they would have for everyone, while also being appreciative of their support of her.